Melodies plucked from his guitar inspire Jeff Guinn’s expressive tasting menus. For the executive chef of restaurant 11Eleven in The Broadway hotel, tasting menus — small portions of several dishes, often presented with complementary wine pairings — are a specialty he delights in preparing. Part of Guinn’s inspiration — and improvisation — he attributes to his musical muses. When Guinn begins to create a profile based on a variety of flavors and textures, he almost “plays it like a song or mini concert,” he says. Just as a band has many instruments that come together in harmony, Guinn combines ingredients to make his pairings cohesive and appealing to sight and taste. Guinn took a moment from 11Eleven dinner prep to share his approach to developing a tasting menu. As his example, he used the meal he created with chef de cuisine Ben Randolph for the Midwest Magazine Publishers Summit in June. Inside Columbia magazine hosted the event for about 30 guests, including Garden & Gun magazine publisher Rebecca Wesson Darwin and Feast magazine publisher Catherine Neville. For this unique nine-course publishers’ pairing, Guinn seamlessly wove together the theme of all nine dishes by starting in the middle. He chose three main entrée creations that varied in texture: Lapin (rabbit) with fennel, baby carrot and saffron-apple demi-glace; a centerpiece Bistro Medallion au Poivre paired with Star Lane Cabernet Sauvignon from Santa Barbara, Calif.; and Porchetta Napoleon en Croute. With his vision for the main courses complete, Guinn intertwines the rest of his flavor profiles by working his way back to the beginning. To stimulate guests’ appetites, Guinn starts with an amuse-bouche — a small bite that “hits their palate and explodes with many flavors and complexities — smoky, sweet, salty, spicy — to awaken their senses.” For this tasting, Guinn created a Smoked Duck Stromboli, paired with 2014 Evesham Wood Vineyard Willamette Valley Pinot Noir to cut through the richness of the savory dish. Guinn also shared key menu ingredients with Jack Lee of Bommarito Wines to ensure harmonious pairings. For many tasting events, Guinn prepares by meeting with wineries and breweries, tasting and noting the nuances in aroma or flavor before finalizing the menu. He also infuses seasonal elements into menus influenced by a melting pot of culinary styles from classical French to Creole, Cajun and the Pacific Rim. Because he grew up in the Midwest, he admits that he will always enjoy “good ol’ down-home comfort food,” too. Guinn hopes to demystify tasting menus. Anyone may request a tasting and pairing with advance reservations. 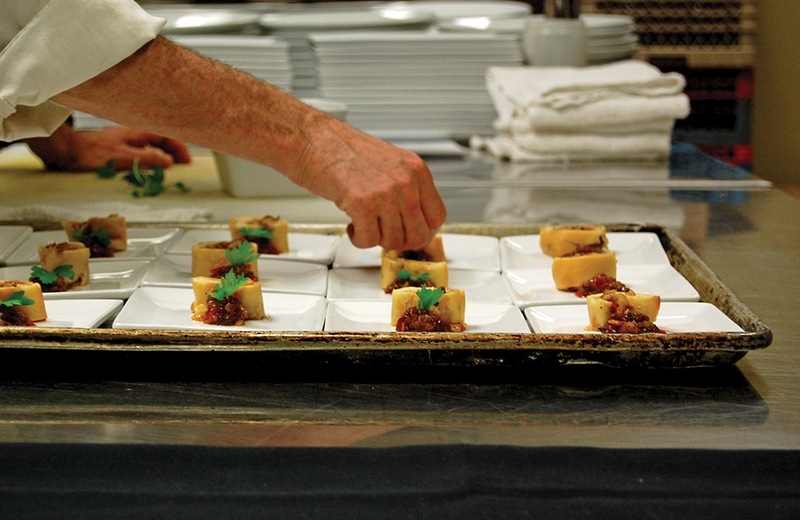 Guinn often prepares smaller tastings for Columbia Culinary Tours as well. He plans to create unique tasting events with tickets available for purchase by the fall. Stay tuned. 2014 Evesham Wood “Willamette Valley” Pinot Noir, Willamette Valley, Ore.
Star Lane Cabernet Sauvignon, Santa Barbara, Calif.